It wasn’t just brisk – it was downright cold when I left for my walk this morning – but no complaints from my corner as it was bright and sunny and no snow! I wish we’d have Winter like the first year I walked, back in 2011-2012; it was like this December has been … cold with the occasional snow – my kind of Winter season. Since it was a work day, I had to slice my mileage in half and settle for around 3 ½ miles this morning. That was one roundtrip to the Park and the entire loop around. At the Park this morning I noticed the edges of the Ecorse Creek were outlined in ice – it was a heavy white margin that went all the way up and down the Creek’s edges, save for a few places where a pair of mallards were preening or bobbing for breakfast. So, it kind of looked like a kid took a brown crayon and managed to crayon outside the lines in those few places. That’s how I did my coloring back in the day – more was outside the line than contained inside the line. The path once again was a little slick from ice and I had to watch my step as I walked along – it is time to unbox the “new” walking shoes I bought in the Spring of 2012 because my current shoes have no treads and horrors of horrors – one of them finally has a hole in the sole. I can’t imagine why – I only have about 1,400 miles on them! I bought two pair of walking shoes, when my other ones wore out, and I intended to rotate them every so often. But then I thought I might get a blister switching to the new shoes … a blister to a walker will stop all the action, so I just kept wearing this pair. All this year, last year and all of 2012 (where I didn’t keep a log, but went the same route every day which I mapped out) … Easy Spirit Punters keep going just like the Energizer Bunny! I noticed a few Christmas trees had already been set out at the curb, and I smelled them before I saw them in the crisp morning air … I was trying to identify whether they were fir, pine or scotch. Some still were covered in tinsel which was flapping around a bit in the breeze and when I got to the Park, I noticed a few pieces of tinsel glittering on the trail. I supposed some enterprising bird lifted them from a Christmas tree and brought them back to the nest only to find out it wasn’t going to create much warmth, so they pitched them right back out. I fed the squirrels, or perhaps I should call them “my squirrels” as they came running up to me as soon as I started on the path – no doubt the sun this morning got them out and about earlier. I was passing out peanuts and I knew that if a thought bubble was over those little guys’ heads, it would say “I thought you told us a month ago you probably wouldn’t be back and here you are everyday” … well, I too, am ecstatic to eke out a few more days’ worth of walking. I got my morning smile watching a golden lab romping in the grass in between the loop area. Its owner had taken the leash off and it was frolicking like a filly the first time out in the paddock on a warm Spring day. That dog was going airborne and jumping around so much, but I really don’t think it was just the springy grass, tinged with the heavy dew – I think it was the red felt jacket that was cinched too tightly under its stomach. It was a full-length bright-red jacket and all that dog needed was a wide black belt with a big buckle and a Santa cap to make the look complete. 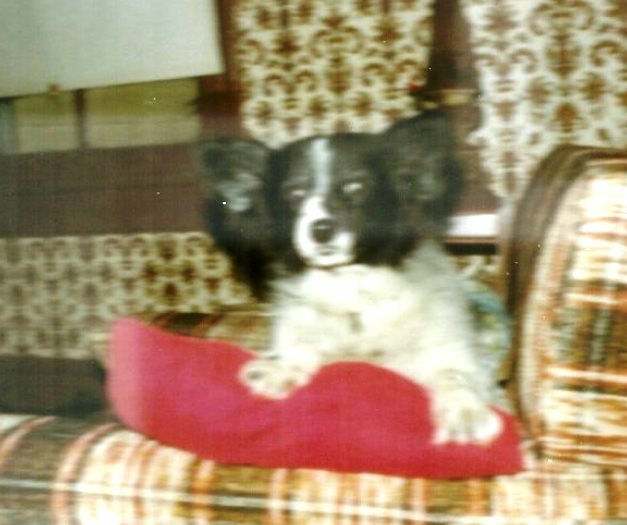 Many years ago my aunt Frances bought her dog Apache, who was a Heinz 57, a Santa Claus suit. He looked absolutely ridiculous in it – the coat with the belt and buckle, a Santa pointy cap and four rubber boots. The hat refused to stay on his head due to his enormous furry ears. Frances had to use bobby pins to keep it in place for a picture. Apache tolerated the outfit, even posed for a picture in it, but he would not move his feet in those boots. He planted his feet on the floor and refused to walk and had the most-pitiful look I’ve even seen on a dog. I wish I had a picture of him in that Santa suit but here he is pictured above. He was a much-loved member of the family and he thrived on being the center of attention all the time … except in that silly Santa suit. Apache looks happy here. Yes it was nippy today. I did enjoy the sun coming threw the windows. Ventured for the mail and that was that. How many miles do you have on your dainty little feet this year? Well Marge- you are up even later than me and one of my NY’s resolutions is to get to bed earlier … as of this morning I have 558 miles and hope to be at 565 to close out the year … who’d have thunk it? Again, without those mornings that I didn’t go out and came back earlier as I thought scrapper would come and scare Buddy, I might have made it to 600 miles this year as you suggested I might about a month ago. Even colder today – just heard 18 degrees and a 9 degree windchill. That melon coat comes out for sure this morning. Are you still having breakfast with the ladies every Monday and Tuesday? Was Glennaray in that group that gathered at Big Boy? That Apache was something else – named for an Apache horse with all the black spots on his back – his ears were enormous. Whenever we visited my grandmother/aunt (they lived in the same house – Frances lived upstairs) I’d take Pache for a walk every day. Everyone in the neighborhood knew him and we stopped and he got a little pat or a “hi Pache” … he got the parvo virus and vet thought he picked it up on the streets walking – suddenly he was gone and my aunt and grandmother were devasted. A friend of my aunt’s gave her Muffin a few weeks later. He was cute but not the sweet and gentle dog that Pache was.